Look no further! Here's all the proof you need. Some few months back, the duo of Don Jazzy and D'banj collaborated with award winning American rapper Snoop Dogg in the remix video for Mr. Endowed. Few days ago, we were told that this duo has been signed by Kanye West. 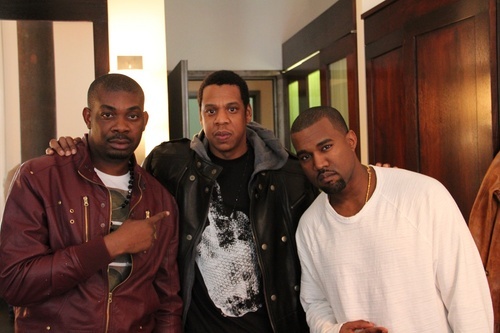 This morning (Friday June 10), Don Jazzy tweeted posted a picture of himself, jayz, and Kanye West. He also tweeted: "
Don Jazzy, Jay Z and Kanye West. More pics coming soon to Mohitsrecords website. stuffs 2 say abt ths moment U shld C a dr cos really we no get time 2 C u.
dotted lines for ALL OF US. we all pray 4 d big picture. it starts NOWWW guys." 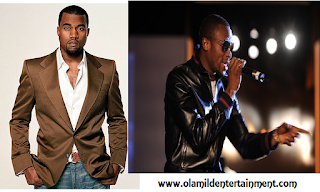 It looks like Kanye West has signed of one of Nigerian’s premier artists D’banj to his G.O.O.D Music label. The rumoured joint venture deal between D’banj’s Mo’Hits Records and G.O.O.D. Music was announced yesterday via the MTV African Music Award and MOBO Award winning artist’s Twitter account. He tweeted, “Just like yesterday myself and my brother did Tongolo. 7yrs later Mo’ Hits signs with Good Music. Best birthday gift ever. God thank u.” Mo Hits CEO and in house producer, Don Jazzy, has also reportedly also signed to to Kanye’s label. Speaking to D’Banj’s manager, Sunday Are of List Entertainment, he confirmed that there have been talks recently but D’Banj officially signed the contract today. “Yes there have been discussions between the two parties lately. They h ave been exchanging contracts but now the wait is over, he said. John Legend and Common were the first to sign to the management and production company. Their albums “Get Lifted and Be” (both executive-produced by West) were both critically acclaimed and combined were nominated for 7 Grammy Award nominations. “Get Lifted” had three nominations and “Be” had four.